What’s Google up to supporting the anti-science crusader and climate-change denier U.S. Sen. Jim Inhofe? 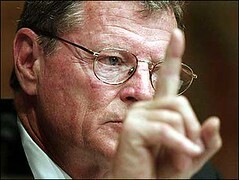 Google, according to Forecast The Facts, “has been a corporate leader in fighting climate change pollution,” but what makes the fundraiser seem even stranger is that, at this point, Inhofe, 78, doesn’t face any real competition in his 2014 reelection bid and he’s hardly going to go begging for campaign funding given his past financial support from the oil and gas industries. Here’s the information for the lunch, hosted by Google Washington, which costs from $250 to $2,500 attend. Inhofe, as we all know here in Oklahoma, has called global warming a hoax created by liberal scientists. Through the years, he has made other outlandish statements about climate change and even published a book expressing his controversial and unsubstantiated views. That’s the type of belief system Google, one of the main cutting-edge technology corporations of its era, supports when it hosts fundraisers for ultra-conservative and religious politicians, such as Inhofe. I’ve personally never viewed Google as anything more than a large corporation willing to do about anything for the bottom line, but it’s still disheartening to see this type of obvious contradiction and pandering. It shows just how broken our political system remains, and how corporations and their lobbyists control so much of our political reality as they pander to extremists.